How to add RSS feed counter in your blog? Follow all steps given in Add Email Subscription Form if you have not feedburner account,if you have then login your aacount and follow instuction given here. 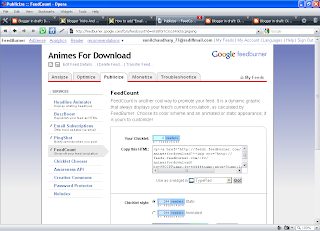 Instead of geting email subscription form,we will get feed counter code for feed counter. Step-1. Click on publicize as shown in image above. Step-2. Now click on Feed Count in leftside you will see page as given above in image. In default this service is inactive click to active it. Step-3. You can change the colour of counter and text if you want, in default it is sky blue. Step-4. Save changes if you made any changes in colour of body and text. Step-5. there is two options for counter static and animated. Choose one copy code and paste in your blog or site where you want to appeare this counter.